Now there's a single reference to which architects, designers, and engineers can turn for guidance on all the key elements of the design of blast resistant buildings that satisfy the new ASCE Standard for Blast Protection of Buildings as well as other ASCE, ACI, and AISC codes. 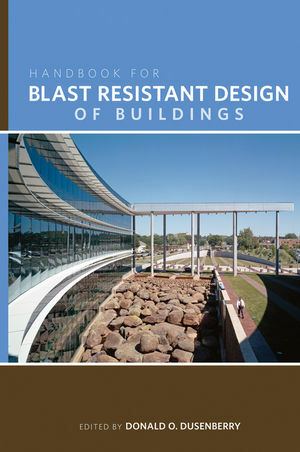 The Handbook for Blast Resistant Design of Buildings features contributions from some of the most knowledgeable and experienced consultants and researchers in blast resistant design. DONALD O. DUSENBERRY, PE, is Senior Principal of Simpson Gumpertz & Heger Inc., where he has worked since 1975. He is also the Committee Chair of the ASCE/SEI Blast Protection of Buildings Standard Committee and the ASCE/SEI Minimum Design Loads for Buildings and Other Structures Standard Committee, and he serves on the Board of Governors of the ASCE Structural Engineering Institute. Serving as the principal investigator, Mr. Dusenberry studied the sinking of the Lacey V. Murrow Memorial Bridge near Seattle, the collapse of L'Ambiance Plaza in Bridgeport, and the 9/11 attack on New York City's World Trade Center. 1 General Considerations for Blast-Resistant Design (Donald O. Dusenberry). 1.4 Structure As an Influence on Blast Loads. 2 Design Considerations (Robert Ducibella and James Cunningham). 2.2 A New Paradigm for Designing Blast-Resistant Buildings, Venues, and Sites. 2.3 A Brief History of Recent Terrorist Attacks. 2.4 Collaborating to Analyze Risk. 2.9 Some Recent Examples of Security Design "Best Practices". 2.11 Security Design Consideration Guidelines. 3 Performance Criteria for Blast-Resistant Structural Components (Charles J. Oswald). 3.2 Building and Component Performance Criteria. 3.4 Empirical Correlations between Response Parameters and Component Damage. 4 Materials Performance (Andrew Whittaker and John Abruzzo). 4.4 Strength-Reduction Factors for Steel and Reinforced Concrete. 5 Performance Verification (Curt Betts). II BLAST PHENOMENA AND LOADINGS. 6 Blast Phenomena (Paul F. Mlakar and Darrell Barker). 6.3 Characteristics of Blast Waves. 6.4 Prediction of Blast Parameters. 7 Blast Loading (Paul F. Mlakar and William Bounds). 7.4 Side Wall and Roof Loads. III SYSTEM ANALYSIS AND DESIGN. 9 Structural Systems Design (Robert Smilowitz and Darren Tennant). 10 Building Envelope and Glazing (Eve Hinman and Christopher Arnold). 10.7 Reduction of Blast Pressures. 11 Protection of Spaces (MeeLing Moy and Andrew Hart). 11.1 Areas Isolating Interior Threats. 12 Defended Perimeter (Joseph L. Smith and Charles C. Ellison). 12.5 Blast Walls and Berms. 13 Blast-Resistant Design of Building Systems (Scott Campbell and James Ruggieri). 14 Blast-Resistant Design Concepts and Member Detailing (Steven Smith and W. Gene Corley). 15 Blast-Resistant Design Concepts and Member Detailing: Steel (Charles Carter). 15.2 Blast Effects on Structural Steel and Composite Structures. 15.3 Analysis and Design of Structural Members. 15.4 Steel Material Properties for Blast Design. 15.5 Design Criteria for Blast Design. 16 Blast-Resistant Design Concepts and Member Detailing: Masonry(Shalva Marjanishvili). 17 Retrofit of Structural Components and Systems (John E. Crawford and L. Javier Malvar).